Archivist (Cataloguing) Anna Flood talks about our collection of 4988 Post Office notices, dating from 1768 to c.2000. They reveal a lot about the services the Post Office provided, and the society in which it operated. 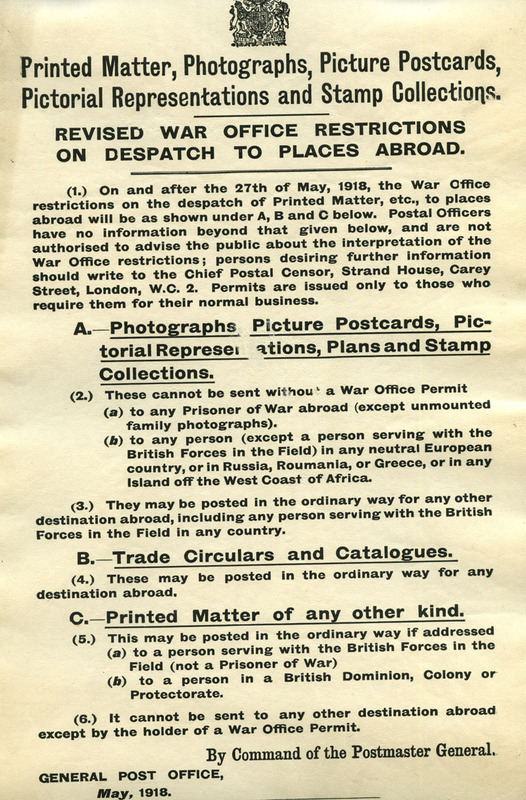 The notices can be seen as a precursor to the posters displayed in post offices and on mail vans after the establishment of the Post Office Public Relations Department in 1934. 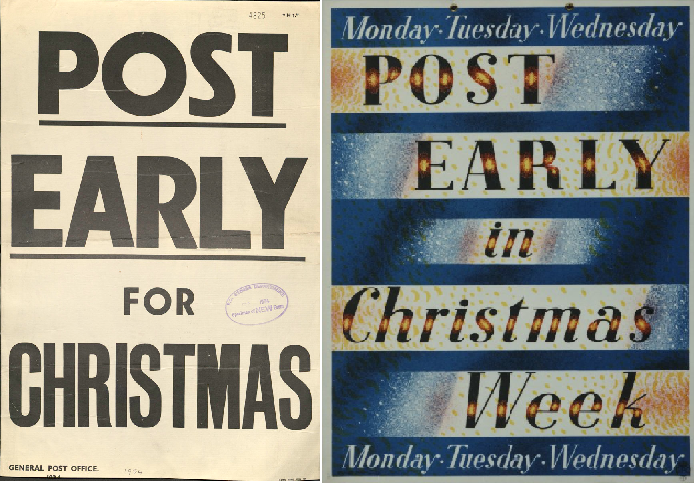 You may be more familiar with images such as the ‘Post Early for Christmas’ poster below; much more visually appealing than its predecessor. 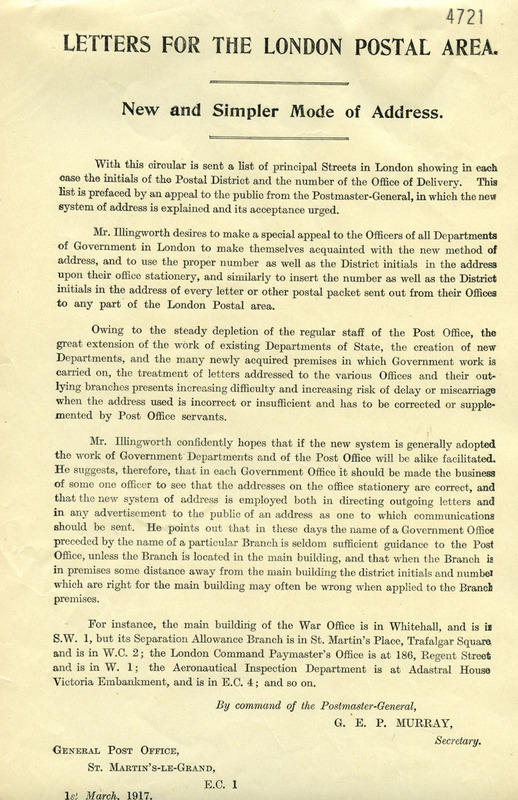 Under the direction of the Public Relations Officer, Stephen Tallents, the organisation employed posters as a means of advising the public, and staff, on services whilst simultaneously constructing a modern and exciting corporate image. Hence, monochrome and purely instructional public notices declined sharply in number from the 1930s onwards. Some of the early posters reflect a more brutal and unforgiving society, where you could be hanged for stealing letters from the mail, or risk attack or even death whilst driving a mail coach. 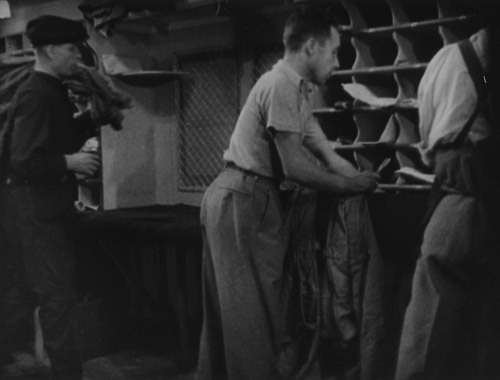 In a world without telephones or the Internet, the efficiency of the mail was paramount. Hence, post-boys could be punished by committal to a house of correction for a month’s hard labour for loitering and delaying the arrival of mails at the next post town. Such a punishment was obviously no deterrent to those mail guards caught drunk on duty (POST 107/284). Whilst overland communication was still by mail coach until the mid-nineteenth century, the list of exotic oversees places to which mails were carried from Britain was extensive and growing. In 1845 packet ships sailed to Beirut, Bombay, Panama and Canada, amongst numerous other destinations. 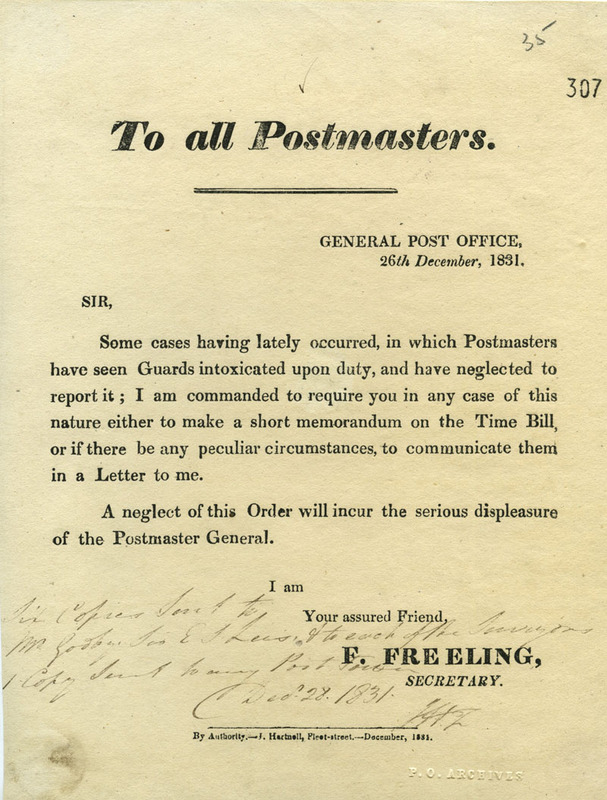 The notices are not solely indicative of postal operations, but inform on significant historical events, such as the 1875-76 British Arctic Expedition, which gathered large amounts of data on Greenland, and previously unexplored territories. 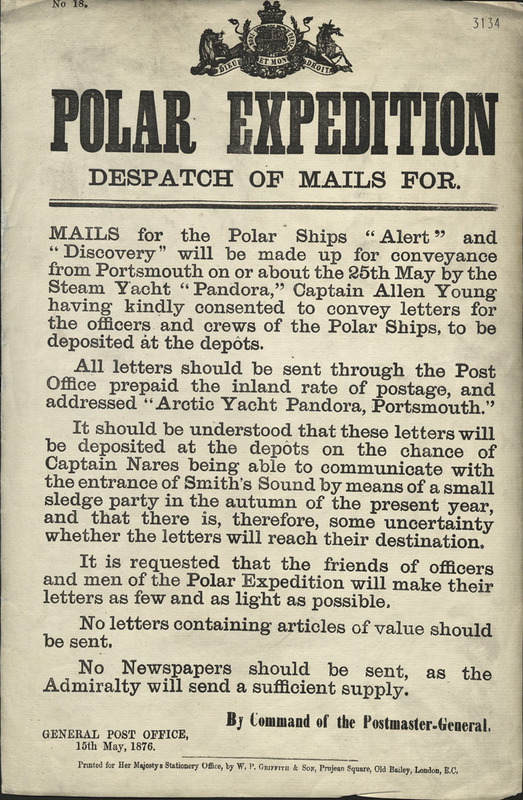 The notice below indicates the vital, but uncertain, mail communication by HMS Pandora to Smith Sound, an uninhabited Arctic sea passage. POST 107/866 outlines the reasons behind the refinement of the postcode into sub-districts and serial numbers (e.g. EC1), including wartime depletion of staff and creation of new Departments of State. This necessitated a more specific means of addressing mail to assist female sorters taking over from the men who had gone to war, and who did not have the knowledge and experience these men had acquired over the years. First World War notices are of particular significance as we remember the centenary of its commencement. They give a very succinct impression of how the public were permitted to communicate with those at the Front, including the sending of foodstuffs, and photographs, postcards and plans according to censorship regulations. The collection of notices are now available to search on our catalogue and consult in our Search Room. 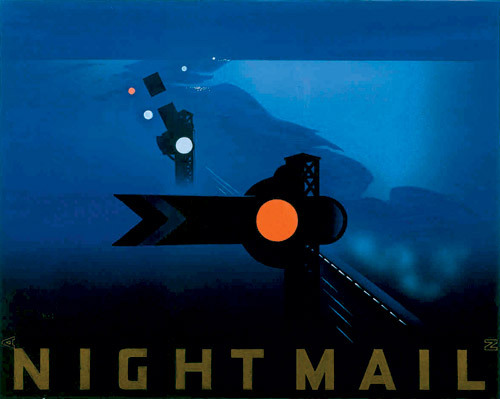 The British Postal Museum & Archive’s poster collection holds designs by many giants of 20th century graphic design, including Edward McKnight Kauffer, Tom Eckersley, and Jan Lewitt and George Him. However, many of our posters also feature images from painters and artists too, and include work by famous 20th Century names like Ruskin Spear, and the brothers John and Paul Nash. Two of the most fascinating are those designed by Vanessa Bell and by Duncan Grant, members of the famous Bloomsbury Group. Named after the area of London in which it was based, the group also included Bell’s sister, Virginia Woolf, the economist John Maynard Keynes, and the writer Lytton Strachey (Grant’s cousin) amongst others. Bell and Grant formed part of a complex web of relationships within the group: they had an affair which produced a child, Angelica, whom the art critic Clive Bell – Vanessa’s husband – brought up as his own. Grant, meanwhile, continued an on/off relationship with the writer David Garnett, who then went on to eventually marry Angelica, when she was in her early 20s. Despite their affair apparently ending shortly after Angelica’s birth, Bell and Grant remained close and lived together for more than 40 years until Vanessa’s death. Just as interesting, however, is the story behind the work they produced for the General Post Office (GPO), and the different receptions it received. 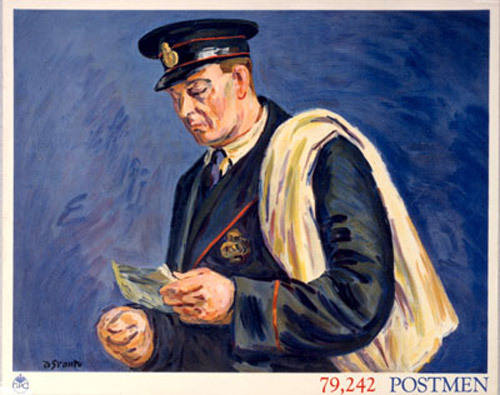 Both Grant and Bell accepted commissions to produce poster designs for the Post Office, and Grant’s 1939 design of a postman was successfully used in the schools educational series. 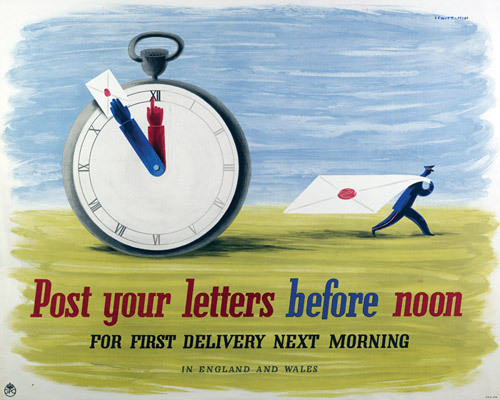 Bell’s 1935 poster ‘The Last Minute’ however, despite having been commissioned by legendary GPO publicity officer Stephen Tallents (who wrote to her suggesting that ‘Instead of merely commanding them to post early, we will show them how ridiculous they look, and what inconvenience they suffer, when they post late’), was eventually rejected. 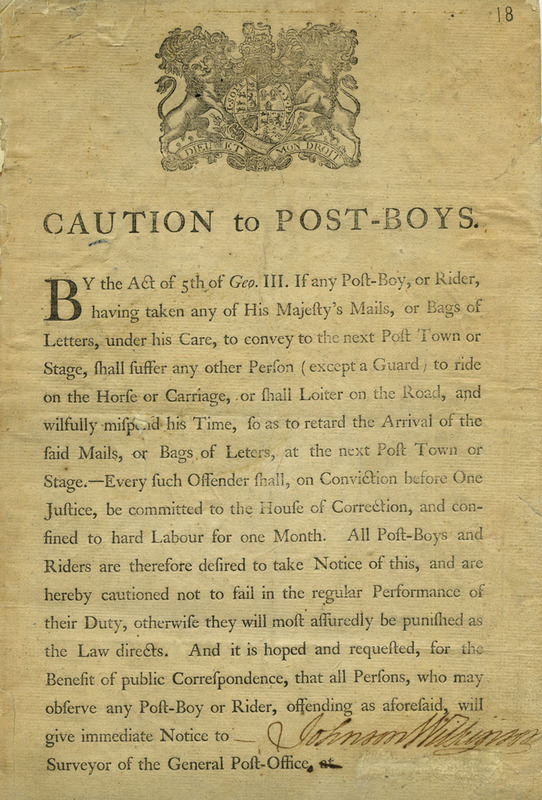 As regards ‘The Last Minute posters’ by Mrs Bell, however much one may admire it as a painting, I am afraid that it scarcely conveys the message which the Post Office wishes to convey on the subject of Early Posting and with great regret, therefore, I must inform you that this cannot be used. While the posters differ stylistically, in substance they are similar: each highlights the human face of the Post Office, emphasising the service aspect and portraying postal workers as calm, collected and efficient. Equally, both represent a painterly style in contrast to the growing prominence of graphic design, which became the hallmark of GPO posters throughout the 40s, 50s and 60s. Making up for its initial rejection, Vanessa Bell’s poster can now be seen in the BPMA’s poster exhibition ‘Designs on Delivery’, currently on show at the Great Western Hospital, Swindon. 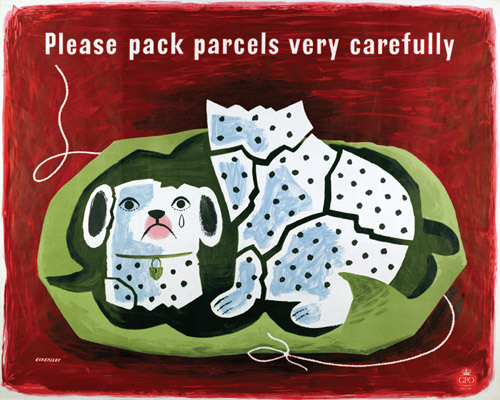 See more posters from the Royal Mail Archive in our online exhibition Designs on Delivery. From Tuesday 19th March to Thursday 27th June 2013 selected posters from The BPMA’s Designs on Delivery exhibition will be on display at Great Western Hospital, Swindon. Design played a crucial role in promoting social progress and technological change across Britain between 1930 and 1960. The commercial poster reached cultural maturity during this period and became the most eloquent of the mass media. 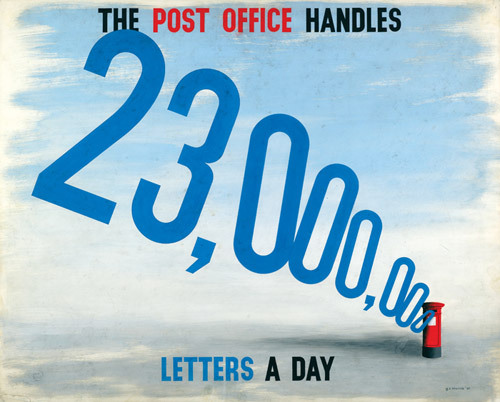 From the 1930s onwards the Post Office became a leader in the field of poster design, commissioning some of Britain’s most recognized artists and designers. This success owes much to the appointment of Stephen Tallents as the Post Office’s first public relations officer in 1933. Under his guidance a Poster Advisory Group composed of key figures in the arts and business led the commissioning process. Some of the posters commissioned were commercially driven. Others were intended simply as self-publicity or for creating goodwill among its publics. The Post Office’s rich store of material could also, wrote Tallents in 1935, make a contribution to the ‘picture of Britain’. GPO posters included work by those associated with both fine art and graphic design, demonstrating the blurring of the boundaries between high art and popular culture that poster design encouraged. This exhibition showcases the best of these posters. The exhibiting of Designs on Delivery has been made possible through a partnership with Paintings in Hospitals. Paintings in Hospitals is a registered charity that uses visual art to create environments that improve health, wellbeing and the healthcare experience for service users, their families and staff. Designs on Delivery will be exhibited in the Temporary Exhibition Space (Main Entrance – Ground Floor) at the Great Western Hospital. The exhibition is open daily. Entry is free of charge and open to all. For opening hours, please see the Hospital’s website www.gwh.nhs.uk or for more information on the exhibition please see our website. If you would like to share your feedback on the exhibition, please contact the BPMA Exhibitions Officer on dominique.gardner@postalheritage.org.uk. On Thursday 8 November the BPMA are delighted to host our guest speaker, David Hay, Head of Heritage at BT Group PLC. David Hay will be exploring the radical change in Post Office telephone marketing strategy in the 1930s in a talk entitled Ringing the Change. 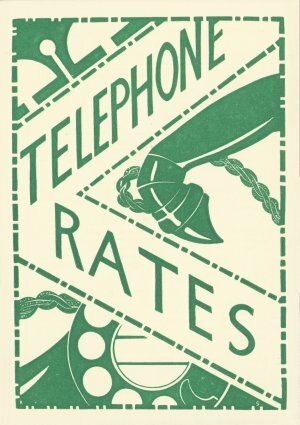 Between 1925 and 1928 the Post Office invested almost £1 million a month in the telephone network as it began the roll-out of automatic telephone exchanges, enabling subscribers to make local calls directly without involving a telephone operator. The result of this new technology, together with the introduction of new mass-produced telephone instruments using early plastics, was that the cost of having a telephone gradually began to fall. The Post Office also introduced new services during this period, such as the first transatlantic radio telephone service in 1926, direct telephone communications with countries in Europe and the expansion of the public telephone kiosk network. 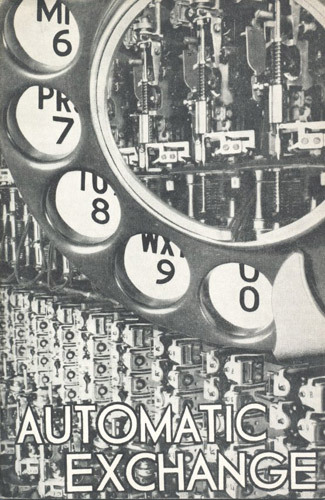 Cover of Automatic Exchange leaflet (BT Archives, TCB 318/PH 637). However, much of this innovation went unnoticed by the public. 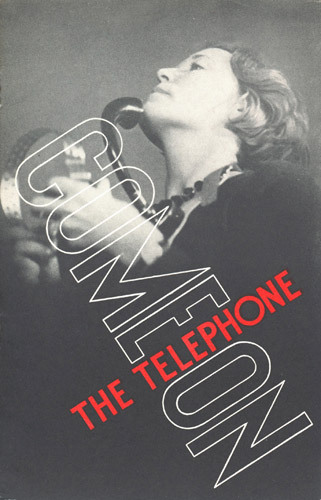 Indeed, despite the enormous investment in new technology, there was widespread concern by 1931 that Britain was lagging behind other countries in Europe in the take-up of the telephone. Up to 25 per cent of the capacity of the telephone network was lying idle. 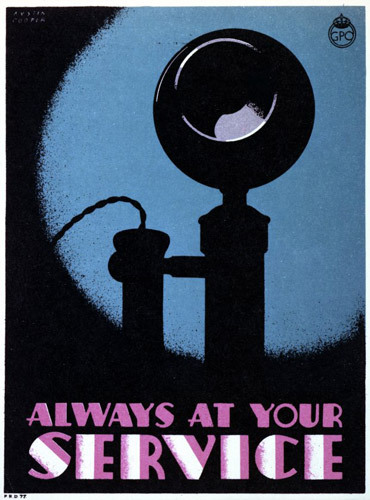 “Always at your service”, telephone service publicity poster designed by Austin Cooper, 1934 (BT Archives, TCB 319/PRD 76). This richly illustrated talk will explore the early attempts of the Post Office to address this and to market the telephone to a wider part of society then before, efforts which were revolutionised in 1933 by the recruitment of Sir Stephen Tallents as the Post Office’s first Public Relations Officer. The decade before the Second World War was in many ways a golden period for GPO marketing, not least in the publicity machine unleashed by Tallents who had a passionate belief in the role of the arts promoting what were then Government services. Tallents and his team commissioned artists, designers, film makers and photographers to project a modern view of the Post Office to its customers and to its own employees. The result was that by the end of the inter-war era many of the GPO’s products and services – such as the Jubilee red telephone kiosk designed by Giles Gilbert Scott, the Speaking Clock and the 999 Emergency Service – had become iconic parts of the nation’s cultural fabric, and remain so to this day. And the Post Office itself, which entered the decade criticised on all sides for failing to promote its telecommunications services and communicate its role generally, was ultimately respected as a national asset vital to the country’s success. We hope you will join us for what promises to be a fascinating talk! Tickets are £3 per head or £2.50 for concessions, and can be bought on the door on the night or you can book tickets online. Decorative mapmaker, mural painter, architect, letterer and graphic artist, MacDonald (‘Max’) Gill was born in Brighton on 6 Oct 1884, where the University’s Design Archives are still paying tribute to him and other pioneers of graphic design in their research. 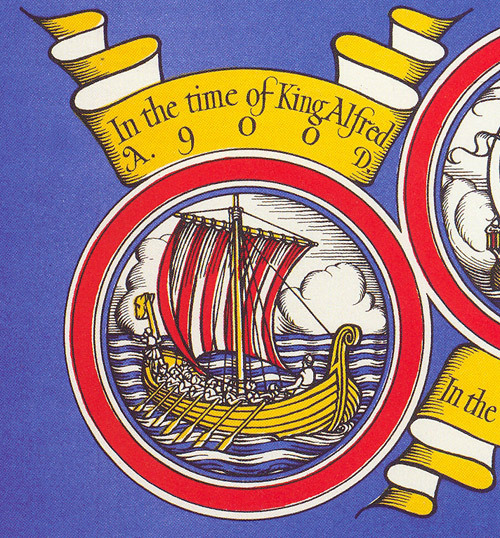 His colourful maps played a significant role in British poster design and colour lithography as a form of dramatic visual communication, and provided a unique combination of information, design and decoration. He redesigned the iconic logo of the General Post Office (GPO) in 1934 and created elaborately decorative maps of mail services. The 1920s and 30s saw the development of modern poster design and visual advertising for large companies and organisations such as London Transport, Shell Oil and various railway companies. 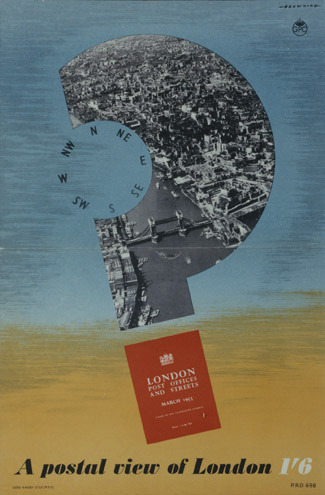 MacDonald Gill produced map posters for the London Underground (most notably the “London Wonderground Map of London Town” in 1914) and was commissioned by the Empire Marketing Board to create eight map designs (best known is his “Highways of Empire” map, 1927) plus some accompanying letterpress posters and the Board’s distinctive logo. Sir Stephen Tallent, Secretary of the EMB, transferred to the GPO as their first Public Relations Officer when the Board closed in 1933. 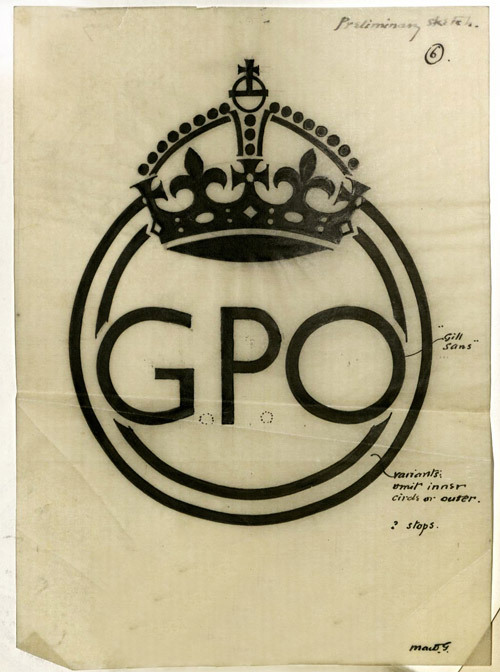 One of his first tasks was to produce a GPO logo – an early example of branding. Even before he had joined the GPO, Tallents had suggested the use of a Post Office badge and commissioned Macdonald Gill to produce the design. The first approved version had two concentric circles but this was soon reduced to one. This was then used on all items of publicity and advertising. Sketch / artwork for the redesign of the GPO logo by MacDonald Gill in 1934 (POST 122/8391). The first approved version had two concentric circles but this was soon reduced to one. The annotations also mentions the typeface used as “Gill Sans” which had been created by MacDonald Gills’ brother Eric. As part of the GPO’s poster campaign to advertise their services and activities to the public, Gill then created a map of international Radio Telephone Services in 1935 (held by BT Archives, Finding No TCB319_PRD0143), and of Mail Steamship Routes in 1937 (pictured above). These elaborately decorative map diagrams were complex and included a wealth of cartographic information and typography. In fact, Gill used his own hand-drawn version of a classic Roman font for the poster title. (He shared this typographic skill with his brother Eric Gill, creator of the widely known typeface Gills Sans. Eric also designed the background of the first George VI definitive stamp series for the Post Office in 1937.) Below the title, the map of the globe, complete with trading routes, is combined with a series of sketches depicting the developments in shipping over ten centuries. It even includes ships that were never involved in the movement of mail such as a Viking craft (AD 908). 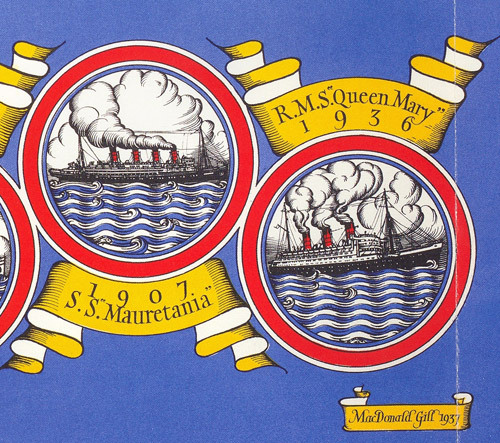 One of the mail ships shown on the map is the RMS (‘Royal Mail Ship’) Queen Mary. MacDonald Gill had also created one of his perhaps most beautiful painted maps for this celebrated liner which made its maiden voyage in 1936: a large-scale decorative North Atlantic Map for the first class dining room. 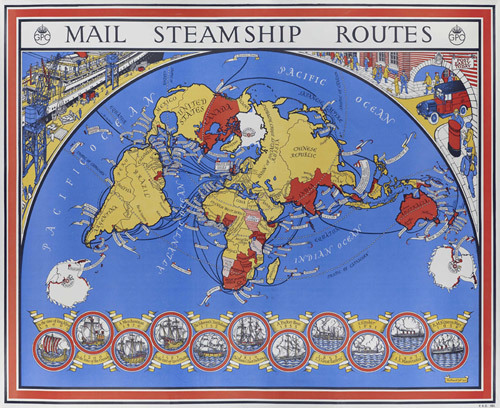 A beautiful reproduction of the MacDonald Gill’s Map of Mail Steamship Routes, 1937 is now available in our Online Shop. The sheet map (approx. 62cm x 76cm) is folded in a wallet and comes with an introduction by BPMA Curator Julian Stray. GPO Posters have played a significant role in establishing a dynamic relationship between the public service and its customers. For instance, they reminded people to use the postal service more efficiently and ‘Post Early’. Thanks to open-minded PR Officers like Stephen Tallents, GPO Posters also became a mirror of British graphic design particularly from the 1930s onwards. The GPO’s public relations department – the first government ministry PR department ever – saw the educational potential of poster design and combined it with a high standard of modern art. 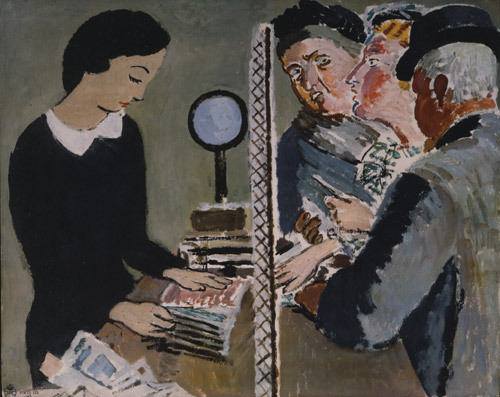 The Post Office offered employment to many artists and graphic designers; many of them helped shape the world of design and art during their careers. These included Tom Eckersley, Frank Newbould. and George Him and Jan Le Witt, better known as the Lewitt-Him partnership. One example of how those campaigns were linked to creative design and the distribution of business information can be illustrated in the numerous posters advertising Post Office directories. 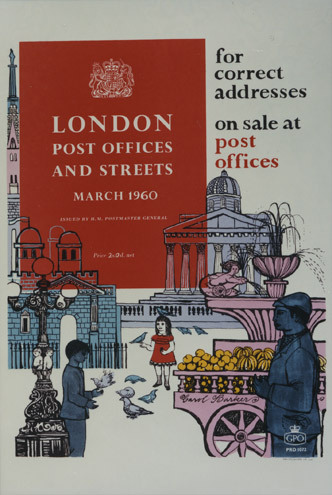 This ranged from directories of the businesses and services available in cities throughout Britain to publications such as the ‘Post Office Guide’, ‘Post Offices in the United Kingdom’, ‘London Post Offices and Streets’, and ‘Postal Addresses’. They provided valuable resources for marketing and sales departments and were updated every year. The works of artists like Lewitt-Him, Alick Knight or M H Armengol illustrate how these campaigns succeeded in presenting a functional product with iconic images and ingenious designs. 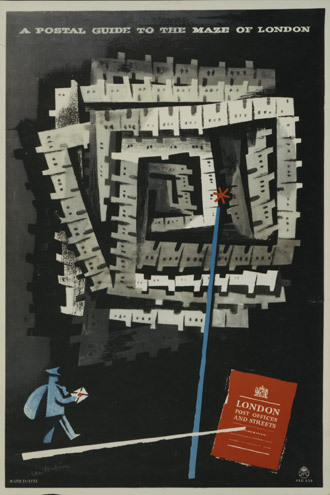 Probably one of the most prominent posters is Lewitt-Him’s ‘A Postal Guide of the Maze of London’ (1951) which depicts a postman about to enter a stylistic maze of houses. The publication provides details of Post Offices, their streets and district numbers, hours of business and a listing of street names – a perfect aid for the postman’s journey into the intricate maze of streets. The partnership of the two Polish-born artists Jan Le Witt (1907-1991) and George Him (1900-1981) was a very successful collaboration in graphic design and they created several posters for the Ministry of Information during the Second World War and murals for the Festival of Britain (1951). Other poster artists may have remained relatively obscure but their creativity had resulted in some fine GPO poster art. 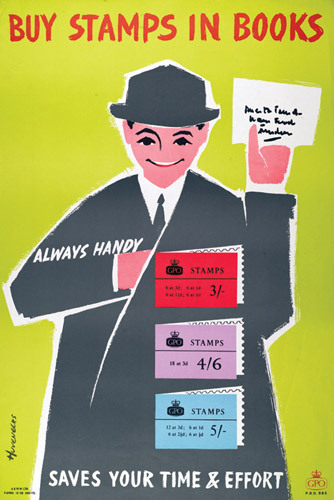 Alick Knight, for example, contributed to several Post Office campaigns, including for the Post Office Guide during the 1950s. 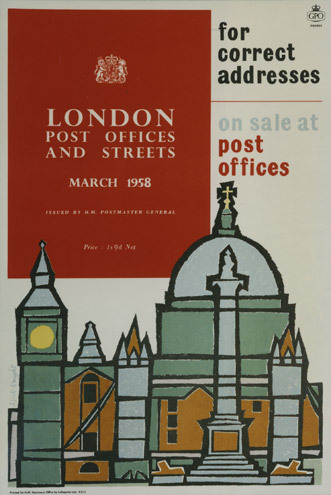 Several of his posters feature drawings of iconic buildings like the one for the ‘London Post Offices and Streets’ (1958). 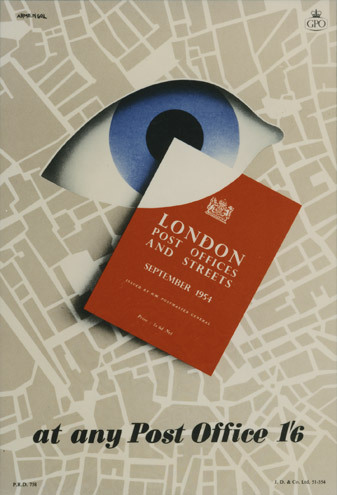 Although these posters advertising the London Post Office Guides were designed to have an immediate impact and relate to a particular product, their designs give them a surprising agelessness and relevance to anyone living in or coming to London. The BPMA have produced a new set of postcards featuring the London-themed posters in this blog. It is now available in the BPMA Shop and further Post Office Guide posters can also be found on our print-on-demand website.